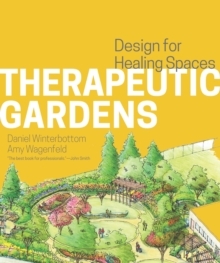 This is the first book to address how to design therapeutic gardens. Landscape architect Daniel Winterbottom and occupational therapist Amy Wagenfeld combine years of experience to provide a practical resource for professionals. Perfect for design professionals who want real world practical design advice. There is an increasing demand for garden designers and landscape architects to collaborate on therapeutic spaces. A comprehensive reference which covers a variety of types of therapeutic gardens for different purposes.